Hello there and happy Monday! Even though I am still recuperating from my sudden cold I could not pass up writing today’s post. Before we get started I have one question to ask, Do you wear white in the winter? I get quite a few questions on how to wear white but instead of suggesting a white denim look I wanted to share with you a new way to wear white this winter. I love a great pair of white denim jeans but I also love white dresses! If right now you are saying “YES, I love white dresses too” then high five girl because this look is for you! White dresses aren’t just for the summer so dust them off and get ready because with just a few accessories you can pull it off for winter. I like to start off with a longer cut dress like this lace midi one I am wearing. Isn’t it gorgeous? I opted for adding in a few black accessories to really make the white dress pop. I started with a black Gucci belt but any black belt will do, just make sure it is on the thicker side. Next I wore my comfy sock boots then topped it all off with a black pom beanie. Now if you wanted to you could of coarse throw over your favorite coat as well. It wasn’t too chilly when I wore this so i didn’t wear one. A friend had called me over the holiday break and asked if I wanted to grab a cocktail and I couldn’t say no to a reason to dress up. I ended picking this look for the occasion and even got a few compliments. 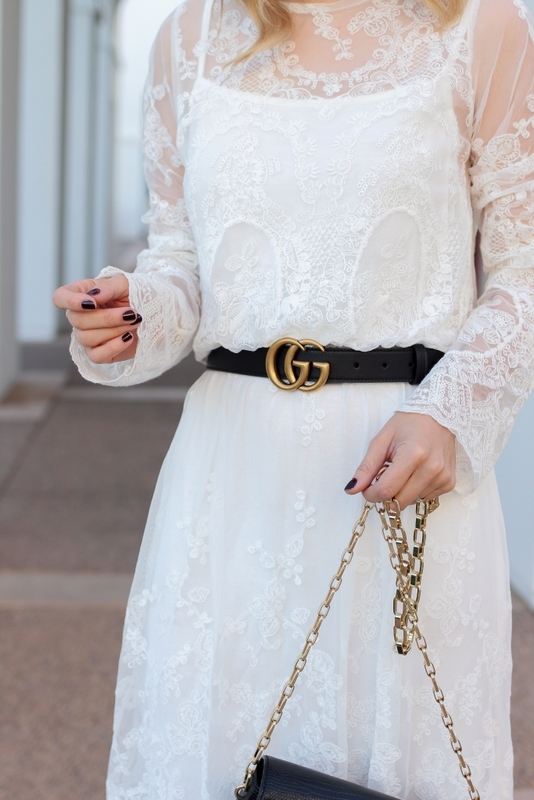 I love this new way to wear white! Who says white dresses are just for the summer? !